"I signed up to be a fighter pilot, not a cop on a beat nobody cares anything about." When Top Gun was released it was often regarded as a sort of ultimate recruiting video for the U.S. Navy. With its fast planes, good looking women, and overall excitement, it helped the Navy witness a bumper crop of eager recruits, each hoping to be Maverick. Behind Enemy Lines may prove to have the opposite effect. It has fast planes, not many women, and loads of excitement, but it also unfortunately features perhaps the most incompetent naval pilot to have ever graced the screen. Originally slated for release in the spring of 2002, Behind Enemy Lines was quickly moved to a November 2001 date to capitalize on the sudden sense of patriotism sweeping America after the September 11th attacks. It worked; in its opening weekend Behind Enemy Lines grossed nearly twenty million dollars and gave a certain young wizard a run for the box office crown. But while it offers a rousing patriotic message (an American fighting to stay alive in a hostile environment), Behind Enemy Lines is hardly a terrific film, as it is a lot like the cinematic equivalent to Vivarin: it offers a quick boost of adrenaline but soon after the rush fades you realize that there was really no point in taking it in the first place. Sent out on a reconnaissance mission on Christmas Day, navy pilots Stackhouse (Macht) and Burnett (Wilson) are given an easy task. Photograph an area the Navy has its eye on and return to the aircraft carrier and enjoy Christmas dinner away from home. The routine mission becomes something more when Serbian forces launch two Surface Air Missiles at the two and eventually force the pilots to eject and drop down behind enemy lines. What the two saw—what made the Serbs shoot them down—was a mass burial site that clearly violates a new peace treaty. Stackhouse is killed in cold blood by a Serb known only as "The Tracker" (Mashkov). Burnett is soon discovered and sets off a cat and mouse game with the Tracker, as well as the entire Serbian army. Burnett is able to establish contact with his carrier and is promised by Admiral Reigart (Hackman) that he will be coming home safely. If only it were that easy, as Reigart's hands are tied due to a NATO Admiral (de Almeida) who secretly wants nothing to do with this rescue as it might effect the peace treaty he has worked so hard to devise. As if there were any doubt, Reigart must go against orders in order to bring Burnett back safely and expose the horrors that the Serbs are hiding. I remember reading around the time that Requiem for a Dream was released in theaters that it created a record for the largest number of cuts ever used in a single motion picture. While I am sure that it still holds the record, Behind Enemy Lines may well be breathing down its neck. First time director John Moore (he got his start in...surprise, commercials) creates such a frantic and exaggerated pace in Behind Enemy Lines that what could have been exciting becomes at the same time too kinetic. Take for example the sequence involving the two SAM's chasing the plane in which Burnett and Stackhouse are flying. The composition of the scene is almost masterful in its tension and pacing, but when the two hit their eject buttons we are shown an unnecessary chain of events underneath the plane detailing just what happens when an ejector button is pressed. This takes away from the tension delivered and reduces it to a cheap "look what my camera can do" moment that lessens the film. Think "MTV Goes to War" and you might have the right idea. There are moments when the film works. The action sequences are very well done and the cinematography by Brendan Galvin paints a beautiful image of Slovakia (standing in for Serbia) in nearly every scene. The numerous sweeping shots are brilliant in their composition, while the more intimate scenes shown in bombed-out villages are also excellent. But the biggest problems with Behind Enemy Lines lies in the redundant, predictable script by writers David Veloz and Zak Penn; from the outset, there is little doubt that Burnett will make it home. Burnett spends nearly the entire length of his journey in broad daylight, free for the shooting by anyone with any skill at all. This is all the more absurd when it is realized that his tracker is an expert marksman, but he can't hit the broadside of a barn. A smarter script would have produced a tighter cat-and-mouse game between the sniper and Burnett, but as it is it misses its golden opportunity for any sort of real tension. As the first non-comedic starring role for Owen Wilson, his performance shows a great range in the gifted comedic actor/writer's abilities. While it may have been easy for the script to bend and flex to fit Wilson's humor (there are some moments at the start of the film where his dialogue is played more for laughs than seriousness), he is offered a straightforward approach to his character. Wilson shows great emotion in his Everyman role here and it works, specifically later in the film when t is clear that Burnett's hopes and energy are fading and he is struck with the realization that he may not make it. Hackman is wasted in what is essentially a supporting role; his scenes call for him to do nothing more than make grand speeches as well as voicing his displeasure for the politics he is forced to deal with. It is a nice performance, but for Hackman (who was in the similarly themed Bat 21), the script is not on the same level as his abundant talent. Image Transfer Review: Presented in a gorgeous 2.35:1 anamorphic transfer Behind Enemy Lines looks nothing short of perfect on this new DVD. From the start, colors are rendered perfectly, from the steely grays and blues of the aircraft carrier to the lush greens and striking whites of the countryside. Sharpness and detail are nicely done, giving the transfer a film-like image that looks better than it did at the movie theater. Edge enhancement, print flaws, and any sort of other flaws are completely absent from this terrific transfer. Audio Transfer Review: Almost as impressive as the video portion is the sound design for this release. Both Dolby Digital 5.1 and DTS surrounds mixes are offered and each proves to be as bombastic a mix as you are likely to find in any recent release. The surround speakers are almost consistently active with explosions and gun shots popping up in several scenes. Ambient sounds are also nicely done, with the sounds of the countryside coming off quite nicely. The .1 LFE channel gets some work, as the effect of a series of triggered land mines causes a near constant stream of tight and well-defined bass. Dialogue is crisp and clear throughout, while the left and right channels showed nice separation, creating an enveloping mix. As is often the case, a head to head comparison between the DTS and Dolby Digital 5.1 mixes yielded no clear winner. Extras Review: At first glance the number of special features on this disc is impressive. Sadly, quantity is not on par with quality, as many of them are just not that interesting. First are two screen-specific commentary tracks: one by director John Moore and editor Paul Martin Smith and the other by producers John Davis and Wyck Godfrey. The Moore/Smith track is by far the more interesting of the two as the pair talk largely about the technical aspects of the film, as well as the style of the editing and direction. It is entertaining to hear the two discuss the stylistic choices, but the track seems to lack any real energy. The two are very tied in to what is happening on screen, which also takes away from the track. The producer's track is mainly for those wishing to learn more about the aspect of producing a Hollywood action film. The pair talk at length about casting, grosses, and working with a rookie director. It is interesting to hear them talk about their discovery of Moore (who was directing SEGA video game commercials at the time) and their faith in his ability to turn in a quality product. While the first track is more about the making of the film, this track is more about hard work and choices that go into the final print. Next is a short, six-minute, making-of featurette that is actually entertaining, a welcome reprieve from the largely promotional efforts on so many discs lately. Interviews with Moore, Wilson, and Navy officers are included and the main subject seems to be the cooperation the crew had with the U.S. Navy. A nice look at the making of Behind Enemy Lines that is both entertaining and informative. Moore and Smith offer commentary on five deleted scenes, each of which seems to have taken a rightful place outside of the finished cut. Some are simply different takes of already existing scenes, only slightly different from the finished cut. Also offered are alternate takes on the opening credits and the climax of the film. The alternate end credits sequence is most definitely worth a look as it wraps up several loose ends and offers a nice split screen effect that helps show concurrent events of interest to the story. Also included is the Pre Vis ejection sequence, a look at the ejection sequence before it became a reality. Finally, and most importantly, is the absolutely stunning teaser trailer for Minority Report, a film that is likely to have fans salivating. 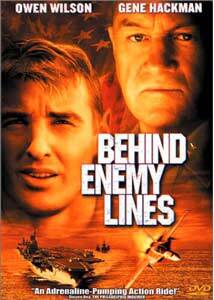 Despite the complete lack of originality found in Behind Enemy Lines, it offers an exhilarating two hours of entertainment. The problem lies beyond the two hours spent viewing the film, as the plot holes and contrivances come flooding through your head. It is the clasic afterthought movie: one that requires very little thought while the film runs, but a lot after.